What I thought was the last resort for my keel problem turned out to be another adventure. I was confident that a haul out in a sling could easily be dropped on the trailer. Unfortunately, they could not drop it, because as they tried to lower it, the boat would lean one way or the other. So when I went to pick the boat up last night, it was still in the sling and I was told that I needed to replace the winch overnight or the they could work on it the next day at $75/hour. Needless to say, I spent last night at the boat yard putting in a makeshift winch in order to retract the 600 lb. keel. Fortunately, things worked as planned and I was able to retract the keel. The haul out seemed like a waste since I could have installed a winch in the water. 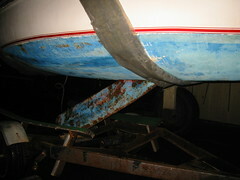 One good thing was that I was able to attach a new cable to keel which I could not do on the trailer or in the water. Well, tonight I hauled the boat home and it is safely on the property, though it will be another adventure getting it beside the garage.